The dental assisting program at Eden Area ROP prepares students with the necessary manipulative skills, technical knowledge, and hands-on experience to obtain career-related employment. 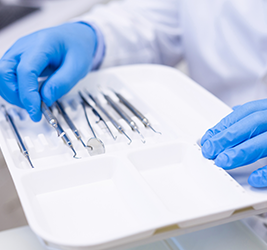 This course meets all requirements for infection control as mandated by the state of California in the California Dental Practice Act. Students who successfully complete this year-long course will be eligible for their x-ray licensure and may advance to our Registered Dental Assistant program. With just six additional months of schooling, our students are prepared to take the state’s RDA exam and apply for licensure. Our Dental Assisting program is open to all adults over the age of 18 who have demonstrated a proficiency in the English language and hold a valid high school diploma or GED. All students must complete their application process and attend a mandatory orientation prior to enrolling in class. ALL RDA program participants must successfully complete our DA program prior to enrolling as an RDA student.